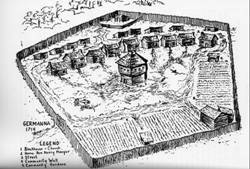 Drawing of layout of Fort Germanna. hen they first arrived, the Germanna settlers joined an earlier group at the Germanna Fort on the Rapidan River, in what is now Orange County. These first settlers – the first colony -- had voluntarily come in 1714 from Siegen, Germany, to work in a mine for Governor Spotswood. They incidentally served as a buffer between the Indians and the English, as Spotswood stated in various documents. Our second group probably was first taken to the fort, but then was actually settled on Spotswood land up the Rapidan River, to the west of the fort, about two miles upriver. Their cabins were primarily on the north bank of the river, and were somewhat spread out in a row. Not long after the arrival of the second colony, the first colony of Germans moved on to what today is Fauquier County, while Spotswood built his mansion -- today called the "Enchanted Castle" near the site of the old fort. The river crossing at the fort site was referred to as the "Germanna Crossing" for more than a century after that time. 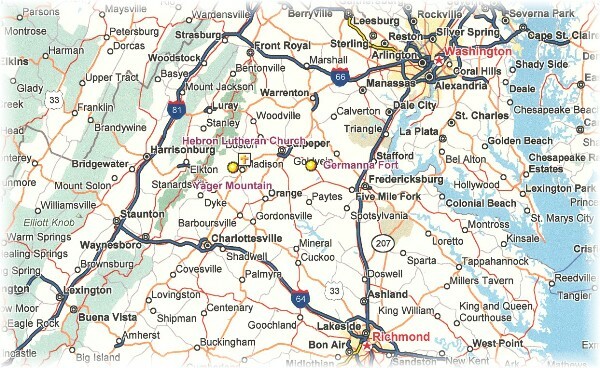 Fort Germanna was located about 30 miles west of Fredericksburg, Virginia, as shown by the yellow dot marked "Germanna Fort." In 1727 Nicholas filed his proof of importation which permitted him to obtain the right to take up land in what is now Madison County, Virginia, some 45 miles to the west. The record of importation is contained in the Spotsylvania County Order Book (1724-1730), p. 142. The location of Yager Mountain is shown near the yellow cross, which denotes the Hebron Lutheran Church. But by 1724, Nicholas, with several other Germanna men, had decided to stop working for Governor Spotswood. Spotswood sued Nicholas and the other Germannans for sums Spotswood alleged were due for the indentures. Spotswood refused to give the Germans a copy of their “covenant” or indenturehood papers, however, and so the Germans petitioned the House of Burgesses in Williamsburg (or the Virginia Council) for a lawyer to assist them, and in this they were successful and were granted the assistance of a former lawyer for Spotswood. Eventually, as it did for others, a jury determined that while Nicholas owed Spotswood about £7, much less than the £35 for which Spotswood had sued. 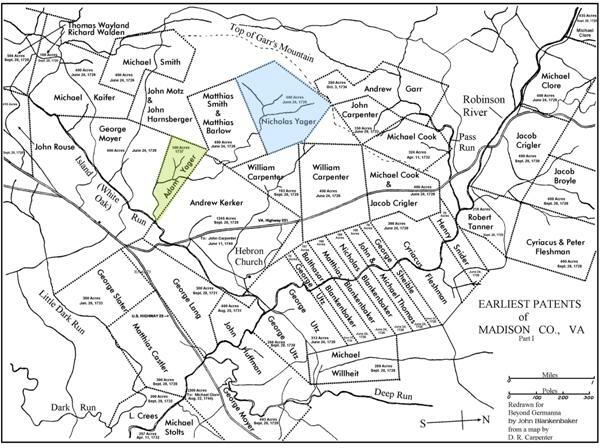 Nicholas, together with most of his fellow Germanna colonists, decided to take up land up the Rapidan River and its tributary, the Robinson River, along a valley of rich bottomland to the west of a 44,000 acre tract owned by Spotswood. This land was offered by the crown for settlement and was free of the purchase price and would be free of taxation for 10 years. When viewed on a topographical map, the valley is fairly unique in its size and location, close to the mountains. Map of original patents taken out by Germanna immigrants in what was then Spotsylvania County, Virginia. It became Orange County in 1734, then Culpeper in 1748, and finally Madison County in 1793. Nicholas' land is shown as well as that of his son Adam. .
Nicholas obtained a land patent (meaning he obtained it directly from the Crown) in Virginia Patent Book 12, p. 483. Nicholas’ 400 acres, however, were up a small mountain and where there is a slight bowl-shaped depression, slightly to the west of the Robinson River and the future Hebron Lutheran Church. There was area flat enough for fields and pasturage, yet there was some distance from the other families in the bottomlands along the river. Nicholas petitioned the court to be free of taxation in 1738, due to his becoming age 60. On 27 April 1738, he was relieved of his obligation to muster or to maintain roads, although he was still to pay the levy. Although the size and location of Nicholas’ land holdings would suggest a certain distance from neighbors, a valuable sense of community – no doubt because of their common travails – must have been maintained among the Germannans. And so, with his neighbors, Nicholas eventually participated in building the Hebron Lutheran Church. The church was built in 1740 on land once owned by Nicholas’ Kerker neighbors, their only child, a daughter, having married John Carpenter. The families of those who built and worshipped in this church would become entangled over the next several decades. It is believed that the beginnings of this church were actually laid in London in 1717 during the period of time that the Germans were stuck in England. In 1720, the legislature in Virginia passed a bill that would have permitted the Germans to avoid paying tithes to the Church of England if they could employ a minister for their church within the next ten years. The colony of Germans was still too small, however, to be able to afford a minister, although two colony members eventually returned to Germany to look for one. The time period granted the Germans passed by. Eventually, certain colony members, who were to travel to Germany to raise funds, stopped in London and – going over the heads of the Virginia legislators -- directly petitioned His Majesty’s Council to be free from the tithing. They were successful for a certain period of time. The congregants contributed for a manse and for slaves to work the manse farm. The church is still in operation today and is the oldest continually-operating Lutheran church in the United States. Nicholas, his children, grandchildren, great-grandchildren, and great-great-grandchildren participated in the life of this church. Nicholas married Susannah Clore Weaver Crigler, after the death of Anna Maria, which we believe to have been in the 1730s. Tithing lists suggest that Susannah and her two sons were living in his household by that time. Nicholas’ naturalization papers have been passed down in the Crigler family and today are housed by the Crigler family in Madison County. Susannah, after Nicholas’ death on July 19, 1764, sold or signed over to two of her Crigler sons two of Nicholas’ slaves, Molly and Harry. The witnesses to the transactions were the sons, Nicholas and Christopher Crigler, Christopher C.B. Blankenbaker, and George Rouse. The background photo was taken in July, 2002, of Yager Mountain in Madison County, Virginia.